Bamboo house design is one of today’s most popular architectural concepts in the world. The artistic impression is the reason most often raised by those who decide to choose bamboo as their main house material replacing concretes. Another advantage of the bamboo house is, beside it’s very easy to find, very inexpensive when compared to other building materials. Even, according to the few studies that have been done, the bamboo house design is a type of building that turned out to be the most resistant to shocks of the earthquake. Therefore, the bamboo house would be more secure than the concrete one. Unfortunately, this material also has the disadvantage that it has a limited durability value to be a bamboo house design. Bamboo contains bamboo powder that is favored by termites. We also need to pay attention to the quality of bamboo, which is usually influenced by the cutting period, the maintenance, the drying, and the preservation. Therefore, there are two common bamboo preservation methods; the traditional way which is by soaking the bamboo in the water or mud and the modern way which integrates the use of the chemical preservatives. The liquid chemicals are absorbed into the pores of bamboo and let the liquid flow throughout the bamboo structure for hours until it’s dry. After that, the bamboo’s ready to be constructed as the bamboo house design. The bamboo house design can also create a fresh and cool nuance inside the house during the heat of the daytime. It’s because the bamboo can save the fresh night air and then release it when it’s exposed by the heat of the sunlight. Likewise when the night falls, the bamboo can present the warmth of the daytime. 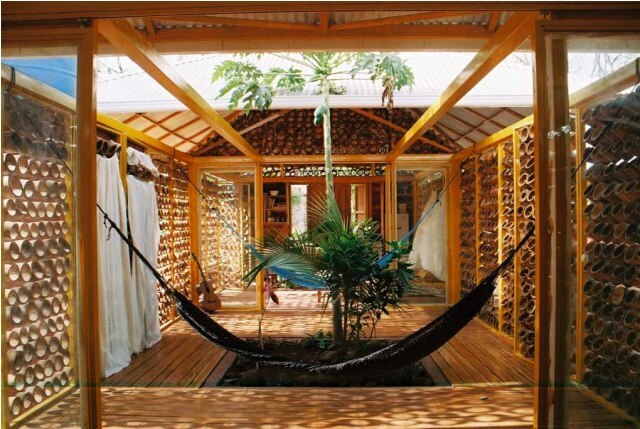 Therefore, the bamboo house design is very suitable for those of you who live in the tropical region.